To my mind, meatloaf really has an unfair bad rap (the dinner, not the singer). It’s often dissed as a lesser evening meal unless it’s dolled up with some pricey cuts of beef or wrapped in pancetta with a veal reduction or something. I’ve always been a fan of the basic domestic dish, which is unsurprising since the only person who likes ground-beef-based family dinners more than I do is Carol Brady. Tacos, sloppy joes, spaghetti and meat sauce? I am down. So I was already on the meatloaf train, but my ardor increased several levels once I started making it in the Crock-Pot. I don’t even remember how I got the idea, except at the time, with twin babies crawling around, I was putting every thing in the Crock-Pot, from my garbage chicken dish to applesauce. Now I can say straight up that it’s the dinner I most enjoy with the least amount of prep work. Yes, even more than garbage chicken. 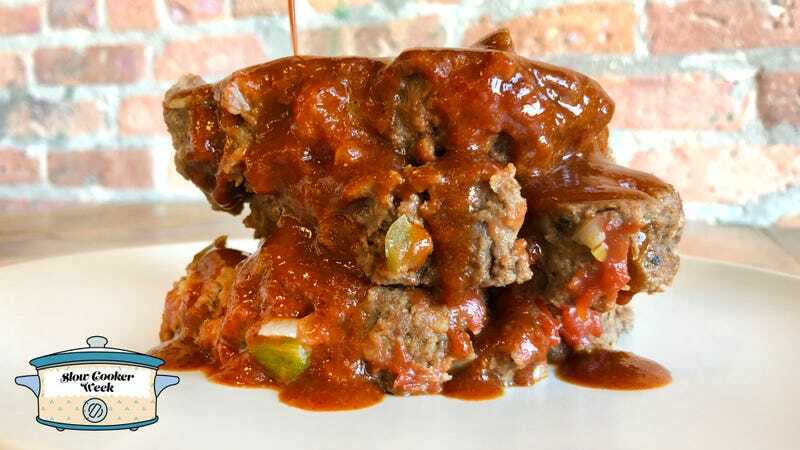 I don’t know why, exactly (something something science), but the dryness that plagues regular oven-cooked meatloaf is nowhere to be found in the delectable moistness of the Crock-Pot meatloaf, which practically falls off of your fork. It has to be tasted to be believed. Mash some potatoes, boil some frozen peas, and you have a dinner classic. So I’m including my recipe honed over several years below; I’ve learned to sauté the vegetables in butter before I stir them in and toss in some cream of balsamic (reduced balsamic vinegar with some brown sugar and black pepper added) for some added flavor. But if you have a beloved meatloaf recipe already, go for it; just suit it up and throw it in the Crock-Pot. The only caveat is that this is not one of those set-it-and-forget-it dishes. A one-pound meatloaf only needs about five hours in the Crock-Pot on the low setting. If you let it go all day, it will resemble shoe leather. And nobody wants a ruined meatloaf on their hands, when they could be having the greatest, easiest dinner of their lives. I made this in the Onion, Inc. kitchen last week and people actually turned away from watching the World Cup to taste it, that’s how good it was. Meatloaf fans unite. Use hands to combine all ingredients thoroughly in a bowl. Then form into a football-like oval shape and squirt more ketchup on top. Wrap in tin foil and place in Crock-Pot. Cook for five hours in low or until the meat thermometer reads 150 degrees. Serve with ketchup or barbecue sauce if you so desire.